Growing up, I had always been an athlete — I played 3 sports in high school and went on to compete in collegiate track and field specializing in short sprints, relays, and the javelin throw. I loved competition but never felt like I could reach my full potential in the sports I played. After stumbling across the CrossFit Games on ESPN during my junior year of college, I was hooked. I started researching and trying to find a gym to join after I graduated. Throughout my 3 years in the CrossFit community, I’ve met some of my best friends, I’m stronger and fitter than I’ve ever been, and discovered my passion for coaching. 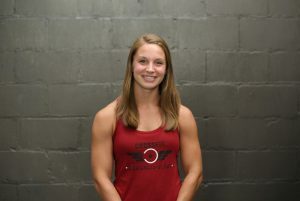 I CrossFit because… I love the challenge and the camaraderie. Every day presents a new opportunity to learn and grow in a box full of friends on the same journey as you. There’s something special about having a friend come over to give you a ‘high five’ after going through a difficult workout together in class. I coach because… I’m extremely passionate about helping clients live a longer, happier, and healthier life. I love seeing people reach milestones they never thought were possible- cure diseases, live pain-free and celebrate new PR’s in the gym. That’s what CrossFit is all about.